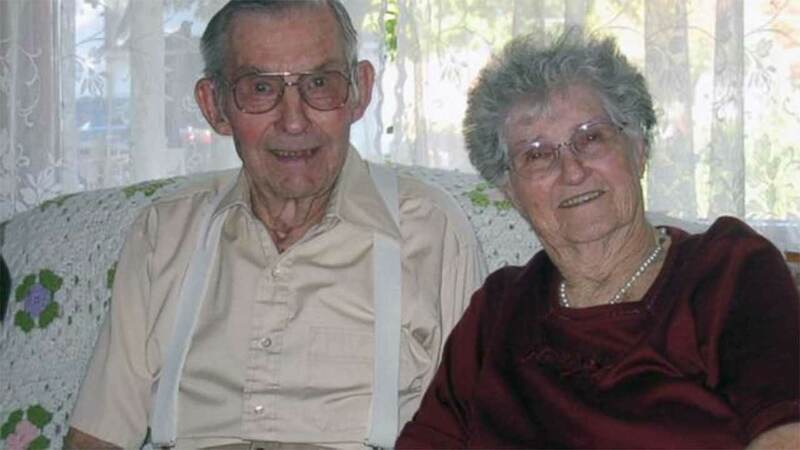 ILLINOIS -- A couple from Illinois will soon be celebrating two major milestones: 77 years of marriage and both of them turning 100 years old! Together, Vera and John Peterson, have seven children, 18 grandchildren, 34 great-grandchildren and three great, great-grandchildren. "I met this tall, handsome guy and you know, it took a while," Vera told ABC News. "It has been wonderful. I'm not saying that everything was all roses. There was a few thorns as always, and I think everyone has that. It can't be perfect, but we have to have give and take." The Petersons were married on Sept. 28, 1939. Their eldest son, 76-year-old Randall Peterson, explains that his father was a farmer most of his life before becoming a carpenter. Vera was a stay-at-home mom until her children were grown up. She later worked at a nursing home for 20 years. Randall says, "It's amazing feat, especially this day in age. Mom's 100 and Dad's going to be 100 in March, which is also amazing. They have their own sense of humor, which we enjoy." For their anniversary, the Petersons are planning on having a low key, celebratory dinner with family. As for their secret to a long marriage, John Peterson credits his favorite saying: "Yes dear!" Read the full story on ABC News.